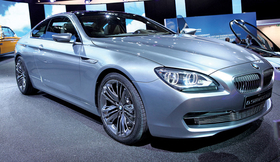 BMW 6 series: It's complicated. PARIS -- Recession? What recession? Given the dismal economic climate pervading the European Union and its looming decision about how to rescue the so-called PIIGS countries -- Portugal, Ireland, Italy, Greece and Spain -- the Paris auto show could have been a dour affair. Instead, we were treated to brash new efforts from automakers that refuse to go down without a fight. It appears design knows no fear of bad economic climes. Here is one reporter's assessment of the show. Audi has coupe fever. The first hit was the rally-inspired Quattro, an homage to the great '80s racing successes. The design is modern angular with a dash of Duran Duran retro in the styling. That was one-upped by a silver, chopped-top version of the e-tron electric car. The squinty headlights, gaping-maw grille and sharp creases in its flanks show that an EV can mean business. Not to be outdone in the Coupe Wars, BMW showed a redesigned 6 series. While plain in the sense of reviving the original 6 series of the late '70s, there is actually some very complicated metal-bending happening in the side sheet metal. Ford's trio of Focuses finally look like the strong competitors Detroit deserves to fight the Asian invasion. Rice-rocket junkies may have to go domestic once they find out the Focus ST will blast 250 hp from a front-drive twin-turbo powertrain. Sayonara, Honda Civic Si and Mazdaspeed3. After encouragement from the domestics, I went by the Chevrolet stand, where a banner proclaimed four world debuts. But the cars' styling was so bland and anonymous, I couldn't tell which cars were new. A bad sign. Perhaps the most significant car of the show was the Lamborghini Sesto Elemento. Its design is akin to a Stealth fighter on wheels, with a clashing of triangles that would make Picasso joyous. The liberal use of carbon fiber shaved nearly one-third of the weight -- 1,000 pounds -- from its sibling Gallardo Superleggera. Lamborghini predicts the Sesto Elemento will go from 0 to 60 mph in 2.5 seconds. That's faster than you can read this sentence. Conversely, the award for "How to Ruin a Perfectly Good Thing" goes to the redesigned Mercedes-Benz CLS. Its previously graceful arching swage line now collides into the rear quarter panel in a chaos of design best described as "body shop." Land Rover slapped a "Range Rover" badge on its entry-luxury Evoque, which seems ready to cannibalize its own LR2. Still, I can't see many Americans buying an undersized three-door crossover with a narrow greenhouse, poor sight lines, an oven-broiler sunroof, and cramped second-row headroom. Speaking of people-haulers, what is a Volvo wagon if not a box? The world is about to find out, with a stylish V60 featuring a sloping hood and tapered roofline. The sheet metal cut for the rear hatch looks more like a knight's shield when it's up. The strong-shouldered side sheet metal remains, but it sure isn't a box. The most underwhelming car award goes to Volkswagen, which wants to surpass Toyota as the world's No. 1 automaker. Perhaps that's why VW unveiled a redesigned Passat that's a dead-ringer for a 20-year-old Camry, which, while excellent for its time, looks dull as dirt today. What's worse, the Passat feels built-to-price. The Jaguar C-X75 is my star of the show. While some may squeal that it steals from the XJ220 supercar and XJ13 concept, its curves are original, and the pooled expanses of sheet metal comprising the hood and rear decklid are simply gorgeous. The interior is pure conceptual nonsense, but fun just the same. And that's what an auto show is all about: practicality with a touch of whimsy thrown in, just like Paris.